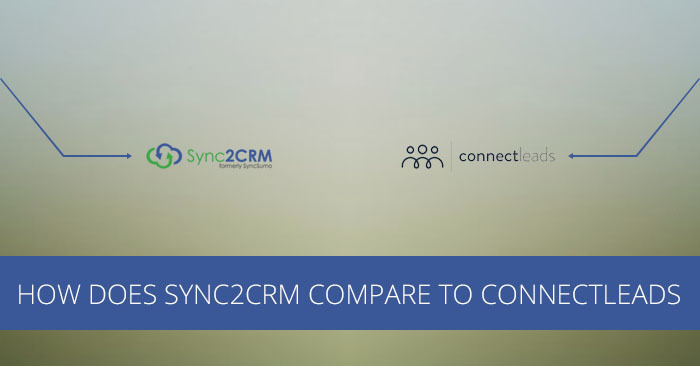 How does Sync2CRM Compare to ConnectLeads? ConnectLeads is a subscription service for migrating Facebook Lead Ad submissions to various SaaS applications. The app is new, as of December 2015 and was created by Dutch Internet Marketer, Wilco de Kreij. ConnectLeads offers a $47 monthly plan and $297 annual plan. During their launch, they offered a lifetime plan for $297 and annual at $197. – Sync2CRM is focused on Infusionsoft. We are Infusionsoft Certified Consultants, Developers and Infusionsoft’s 2014 Most Helpful Partner. We have deep expertise we can use to help you succeed. ConnectLeads integrates with a large number of Saas Apps, not just Infusionsoft. – Sync2CRM not only offers migration of Facebook Lead Ad submissions but syncing of your Infusionsoft data to Facebook Custom Audiences as well. – If you only want Facebook Lead Ad migration, you will only need the Sync2CRM Starter package, as unlimited Lead Ads are included in all of our plans. Our Starter Plan is $37/month compared to $47/month for ConnectLeads. – Sync2CRM allows you to connect multiple Infusionsoft and Facebook accounts to one app. ConnectLeads does not allow multiple Facebook accounts. – Sync2CRM offers paid training courses for those who are new to either Infusionsoft or Facebook advertising.